In 2013 Crystal Worl (Athabascan Tlingit) earned a Bachelor of Fine Art in jewelry metals and an Associate of Fine Art in moving images from the Institute of American Indian Arts. The majority of her art consists of painting, printmaking, graphic design, and clothing design. 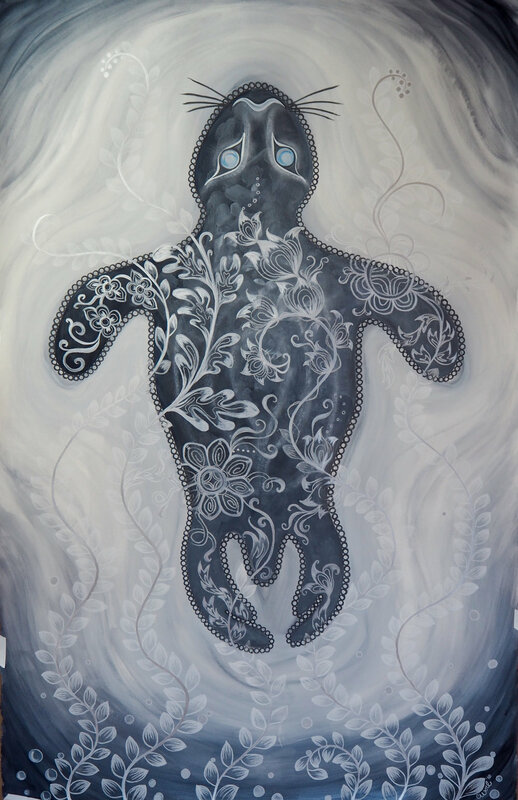 Her work explores the relationships and bonds between her people, the land, and the animals. She lives in Juneau, Alaska, working as a co-owner of Trickster Company. Swimming in an ocean of projects every day, all over the world, Crystal embodies the creative lifestyle. Aerial dancer, visual artist, and now, Indigenous clothing designer. At Trickster Company co-owners Crystal and her brother, Rico Worl, strive to represent a prestigious lineage of art in fresh and energetic ways as a celebration of Northwest Coast culture as it lives today. They launched their first clothing line in October 2016. With all the new and hip work, Crystal still looks to mastering the ancient Northwest Coast formline design. It is essential to run a modern business while keeping the heart of her culture in the forefront, which is why she travels to meet with masters of formline design. When Crystal began her 2017 Artist in Business Leadership fellowship, she had just started to design clothing. But she learned by doing and kept growing into whatever was in front of her, never letting an opportunity pass by. This led to a collaboration with Jared Yazzie (Diné - Navajo) of OXDX. They set up a pop-up shop at the Santa Fe Indian Market where Crystal was a featured designer. She looks forward to more collaborations with artists like First Peoples Fund fellow John Pepion (Piikani).